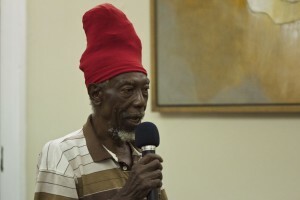 Ras Michael Jeune was my friend, my mentor, my brother. In a little wooden house at Buxton-Friendship Line Top he taught me and others how to write and read poetry and how to write period. He taught us drama and storytelling and short story writing. He is for me Guyana’s best short story writer of his generation. He was a dub-poet before dub poetry was popular. He had a knack for capturing the rhythm of the people in his art. Mike introduced me to the poetry/chant of Andre Tanker and the artistry of Ken Corsbie, Marc Matthews, Johnny Agard and Henry Muttoo. It was he who explained to me that Walter Rodney was an artist too and that Kwayana had that touch of genius. Mike never gave me the impression that he cared for formal politics; he was never a political activist in that sense. His political activism was in his art—his varied art. Even when he was talking to you about regular life he was making art—the organic artist. Mike was also a teacher in the formal system. He taught at Kwayana’s County High turned Republic Cooperative High School in Buxton. His students had a broader understanding of English Literature than the rest of us. He took his artistry into the classroom and it made a difference. Michael was steeped in political reasoning; always reaching for philosophy. He was the first person to clarify for me the meaning of democracy and dictatorship—it came out in an argument he had with a “lil hot hand” name John Cromwell. He and John would remain lifelong friends. I learned about political art from him; he was always making a political point in his work– a cultural worker who stood on the side of the poor and oppressed. Our recent conversations were long and varied—about capitalism, culture and art and about Guyana. Our last oneoccurred a few months ago on a Friday morning around 2 ‘o clock on Friendship Middle Walk, Buxton, in front of Andrew Night Spot. He gave me a treatise on how politicians change when the get into office. He was glad the government had changed but he was not optimistic about Guyana. I often think about howGuyana’s politics have destroyed optimism in our best products. Mike’s parting words to me were “Twilly it’s your responsibility to restore Buxton and Black People to the place that made it possible for you to chant like you doing.” I told him I am always willing to help. I knew his message was less about me and more about the condition of our people—that there was and is another way. He promised me to write something for the young people in Buxton fusing Emancipation and Independence for this year’s Emancipation observances in the village. I don’t know where he was with that project at the time of his death. I love you Mike. Go back to your ancestors and continue your work of the mind and of poor people looking to break free. This year’s Emancipation at Buxton Line Top would not be the same without your voice. But the first libation will be for you. Rootsman to bone. Artistic to the Core. And, yes Ras Michael Jeune earned and deserves a National Award for his contribution to Guyana.